Is Busyness Keeping You from What You Need and Want? Mindfully choose how you spend your time. Certain strategies and approaches generally work well for shorter-term goals, the things we want to accomplish in the near future, such as taking a vacation, purchasing a new car, or paying off a credit card. Lifestyle changes — like breaking your busy habits — require a longer-lasting approach that develops into maintainable strategies and eventually new habits. Changing your relationship with busy necessitates determining your need/want connection and how it relates to your goals. It’s a cause-and-effect formula that when balanced will lead to more sustainable outcomes. For example, if you decide you want to lose five pounds in a week, it can be done. No problem. There are numerous people to tell you how to do it. But is that helpful? Can you get the weight off? Absolutely. However, it’s unlikely that approach will be sustainable in the long run. When a client comes to me because she wants to lose weight and has tried several times, without success, to keep it off, I need to help her find the why now part of her need/want connection. If her motivation is that she wants to look better, or that she’s tired of the extra pounds, that is typically a sign that she has not dug deep enough to make her goal sustainable. Her reasons just scratch the surface of what she really wants. The broader the reason, the less likely the root of the why now has been uncovered. In this case, if she doesn’t believe she deserves to feel or look better, her weight loss is apt to be temporary. How can she be truly successful until she knows the value of what she needs and how it will support what she wants? When she establishes both, her why now will be evident, and she’ll realize her endeavors with less effort and more satisfaction. Before moving on, let’s explore your need/want connection. This is to help you develop the habit of considering your need first, before anything else. Think of it this way. If you know you want to change jobs, what do you need to make that happen? You may need to write a new résumé, network with business associates, buy a new interviewing outfit, and rearrange your schedule so you have time to search for that new job. You know you want a new job, and organizing your strategy for what you need to do first will put the ball in motion to make that new job a reality instead of merely a desire. Often we get so focused on what we want, we overlook what we need to think and do to make it happen. I’m asking you to take a close look at what you need so that your strategies are well formed and more likely to lead to your wanted outcome. Some of us take action to reach a rewarding goal, while others take action to avoid discomfort. Most of us are motivated by the first and temporarily eased by the second. When we cultivate strategies that are derived from well-formed habits, and our actions are supported by self-awareness and clear motivations, we set ourselves up for achievement. Understanding how your brain works when forming habits is a great tool for motivating yourself out of busy and into action. The brain is a powerful, dynamic, ever-evolving tool that is always available, capable of generating an infinite range of subtle and vast changes. Each of us operates from our unique programming — how we interpret our world and how we communicate it to ourselves and others based on our experiences. In a blink of the eye we pull those experiences to the forefront of our minds, apply meaning, and express that meaning with words and behavior. And the more we do this, the easier it is to implement the strategies — behavior and thinking — associated with those experiences. This is where training meets up with habit. Simply by changing how we think about something, we can rewire our brains’ response. When we’re stressed and busy, our brains don’t think clearly, and that’s when we are most likely to fall back on our habits. That’s valuable, especially for those with jobs such as first responders where habits — training — can be lifesaving. However, when we employ habits, which may seem useful in the moment but might not support our bigger picture, it’s time to revamp those habits and establish new ones that work best for what we need and want. Every thought we have is an ingredient of our personal reality. Our thoughts quietly direct our actions. For example, if you spend a disproportional amount of time thinking about an ex-lover, it’s unlikely that you’ll get over him or create any mental and spiritual space for a new person to enter your life. The same is true if you tend to focus on the problem rather than the solution; the problem will remain alive and well, while the solution will be given no space to grow. Your thoughts generate boundless possibilities for your life strategies, for how you manage your unique world, and for the expansion of your mental, physical, and spiritual course. Your brain needs to be recharged, just like your body. Overworking it without giving it a rest has a direct impact on your overall health. Reprogramming your thinking wakes up your awareness and gives you a refreshed way of looking at situations and challenges. It’s a reboot of cerebral assets. When we rest and recharge our thoughts — our brains — we can begin developing new strategies for mindfully choosing how to spend our time. 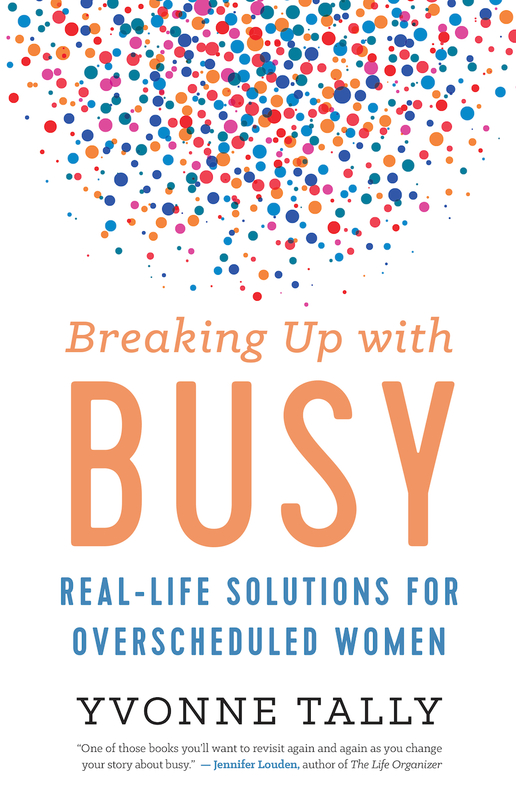 Excerpted from the book Breaking Up with Busy. Copyright ©2018 by Yvonne Tally. Printed with permission from New World Library — www.newworldlibrary.com. Yvonne Tally is the author of Breaking Up with Busy and leads meditation and de-stressing programs for corporations, individuals, and private groups in Silicon Valley. Visit her online at www.YvonneTally.com.